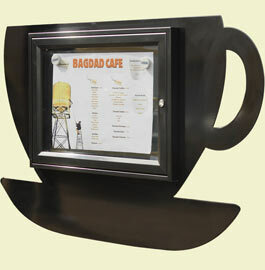 These are quality menu cases with all the strength and durability of our Traditional Notice Boards. 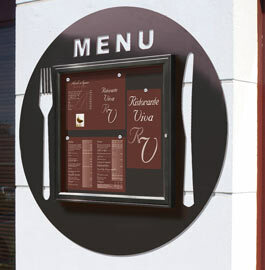 The eye-catching designs make these menu case really stand out when wall mounted outside or inside any pub, bar, hotel restaurant or cafe. 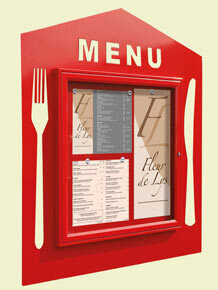 The menu case itself is made with a 30mm frame on zinc plated steel backboard which is painted to match. They are transformed by being mounted on plasma-cut 2mm steel plate shapes.They come glazed with 4mm vandal resistant plexichoc and a safety lock with two keys. 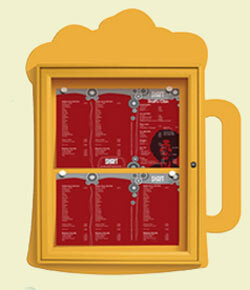 Magnets for menus in place are provided. Click here for more manufacturing details. 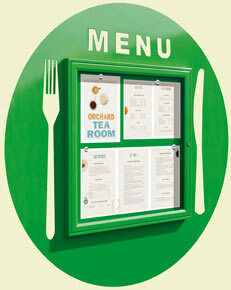 These resturant themed shaped notice boards / menu cases are available in five classic colours - Red RAL 3020, Turquoise RAL 6034, Black RAL 9005, Yellow RAL 1017, Green RAL 6018. Postage rate N (includes VAT) Cheaper shipping rates for more than one notice board. 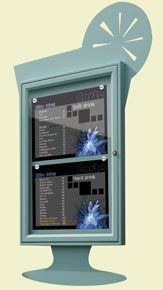 Our team at The Sign Maker looks forward to helping you with your notice board or poster holder.